A Reuters news article on 1 February said that the US, Canada and several Latin American governments claim Venezuelan president Nicolás Maduro “stole his second-term election” in May 2018. They have therefore recognized an opposition legislator – Juan Guaidó – as Venezuela’s interim president. Wait a second. Do they say Maduro “stole” the election from Guaidó? That wouldn’t make sense. Because Guaidó didn’t even run in the 2018 presidential election. Henri Falcón was the opposition politician who finished a very distant second in that election, over four million votes (47%) behind Maduro. Nobody has shown or even attempted to show that any votes, never mind millions of votes, were stolen from Falcón. In Venezuela’s electoral system, a very small amount of ballot stuffing is detectable in any contested election. That’s why, in 2012, Jimmy Carter said the electoral system was the best in the world. Of course, ballot stuffing aside, an election can be grossly unfair in other ways. Much was made about two prominent opposition candidates who were disqualified from running: Leopoldo López and Henrique Capriles. So was Falcón an obscure politician (like Guaidó was before Trump anointed him as Venezuela’s president) who was allowed to run only because he would be easy to beat? Not according to Venezuelan pollster Datanálisis. That’s the opposition-aligned pollster the international media has cited the most for nearly two decades. 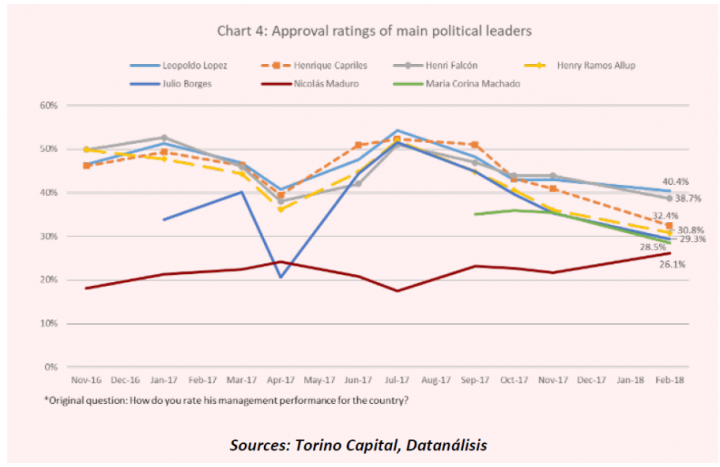 A few months before the election, Datanálisis claimed Falcón, a former two-term governor of the Lara state (2008-2017), was basically in a statistical tie with López for top stop in popularity among opposition leaders. It’s worth recalling that, in Brazil, the election of fascist Jair Bolsonaro was recognized by the governments that now refuse to recognize Maduro, even though former Brazilian president Lula da Silva (who would have had a superb chance to win) was disqualified and imprisoned based on extremely dubious corruption allegations. Moreover, unlike Capriles and López, da Silva was not involved with several US-backed efforts to violently overthrow the government. Was Falcón denied access to media coverage during the election? No. He and his economic advisor, Francisco Rodríguez, travelled all over the country and appeared on Venezuela’s top private TV networks, where they lashed out at Maduro. In fact, Falcón launched his campaign with a 35-minute speech on Venezuelan state TV, in which he skewered Maduro as the “hunger candidate” who had turned the people into impoverished “slaves”. After Falcón lost, he then insisted on a new vote – despite having passionately urged people to vote because he had obtained electoral guarantees. The election was moved back by a month as demanded. His allegation was that the government had bribed voters at puntos rojos (tents set up near electoral centers which are used for exit polling). But there are a few gaping holes in that story. First, votes are secret in Venezuela, so offers of a chance at a prize or other inducements at these puntos rojos can, at best, increase turnout, but not the government’s share of the vote. Second, there were four different groups of observers who monitored the election, and they concluded it was clean. Their reports are here, here, here and here. Third, economic sanctions and threats by the US government were a massive attempt to sway the electorate – to send the message that voting for Maduro will bring intensified economic sanctions (which, in addition to being illegal, were already killing people). Also, US interference in Venezuela’s election certainly makes a joke of alleged Russian collusionwith Trump in the 2016 presidential election that has received so much frenzied media attention. So why wasn’t Falcón ‘recognized’ by Trump? What’s the argument for Trump anointing Guaidó? The US recognizes the 2015 national assembly election won by the opposition – as it would definitely have recognized the 2018 presidential election had Falcón won. And part of article 233 of the Venezuelan constitution says that if the president “abandons” his post, the president of the national assembly takes over until new elections are held. Guaidó was very recently named the national assembly president. Clearly, Maduro did not ‘abandon’ the presidency by soundly beating Henri Falcón in a clean election that was marred, if anything, by murderous US interference. It’s also clear that Trump (and his Iraq-style ‘coalition of the willing’ to oust Maduro) is not Venezuela’s Supreme Court.